Did you know that we offer more than just baby formula? Neocate offers a complete hypoallergenic nutrition range that is tailored for kids with food allergies and associated GI conditions. Now you can look over all available products quickly and easily. View All Neocate Products. For each product, we have pulled all relevant information into one spot: review nutrition and ingredients, read over product FAQs and ratings from other Neocate customers. Food allergies can turn snack-time and mealtime into a challenge. But they don’t have to! We believe that everyone deserves worry-free food experiences. That is why we’ve curated delicious, allergy-friendly recipes that incorporate Neocate and created a brand-new recipes section. You can choose to view all recipes or narrow them down based on product you are using, how much time you want to spend making it or the meal type you are planning. Browse Neocate Recipes. The health insurance landscape can be confusing at times. At Neocate, we offer a free service that can help you navigate the Neocate product access and coverage for your child. This service is called Nutricia Navigator and it helps you do just that, navigate. We realized that it was not easy to find all the services we offer our customers, and we don’t think it should be hidden either! That’s why now you can find coverage information on our main navigation bar! Learn more about Nutricia Navigator. Did you know that you can chat with us on our website? The new website makes it even easier for you to reach out to our team via your favorite way: be it chat, email or phone. Did we mention you can customize your Neocate experience? 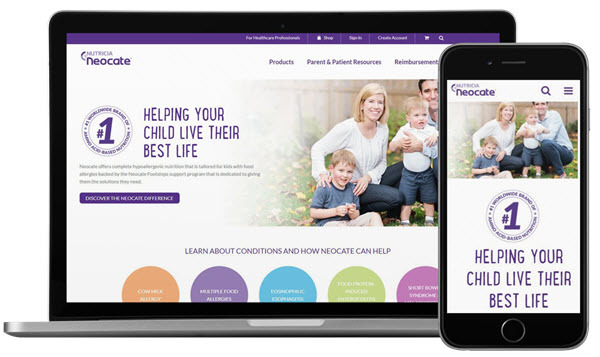 The new website now offers the option to see the information relevant to your food allergy journey: customized for your Neocate product and your condition. If it has been awhile since you signed-in (or maybe not at all), we invite you to continue our online conversation by updating your account information. Our new website will adapt to your screen. It doesn’t matter if you are an Android fan or an iOS loyalist; if you spend all your time on a mobile device or behind a screen of a laptop. Both the text size and layout will adapt to ensure you enjoy your browsing experience. Now that it’s here, please take the time to explore and discover all that this new website has to offer. This is just a highlight of a few sections, but there is so much more! We hope you find the new website helpful for your Neocate journey; we worked hard to make sure it contains valuable information to assist you. As always, don’t hesitate to share your feedback on how we can continue to improve. Happy Browsing!